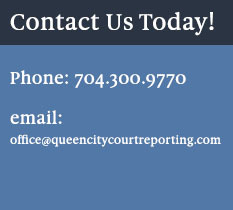 The seasoned court reporters at Queen City Court Reporting strive to be the ultimate solution for all of your deposition and litigation needs. Based in Charlotte, North Carolina, our court reporters have over 50 years combined experience. We bring a broad knowledge base and will work our very hardest to deliver accuracy, professionalism, and timeliness in every single job we take. Our court reporters serve Charlotte and the surrounding areas of North and South Carolina. 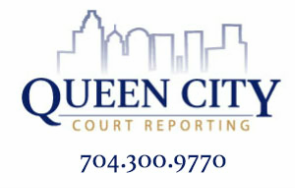 We at Queen City Court Reporting pride ourselves on really getting to know our clients so that we can tailor each job to fit their individual needs. We understand the importance of quality court reporting services and will work closely with you to make sure that your experience is a success from start to finish.